The world premiere of Leading Light is coming soon! Suniti first collaborated with Risk/Reward in the 2009 Risk/Reward Festival under the moniker Hot Little Hands with a piece called Always Merry and Bright, which was an excerpt of a larger work titled Ill-Starred. Two years later, she brought an excerpt of Palace of Crystal to the 2011 Risk/Reward Festival. She’s one of our all-time favorite local choreographers and we can’t wait to experience this new work with powerhouse collaborators like Allie Hankins and Holland Andrews! Suniti Dernovsek is a choreographer, performer and movement educator. For several years she collaborated with visual artist David Stein to make work under the name, bobbevy. Together they created 19 shorter works and six evening-length shows: This is how we disappear (2013); Palace of Crystal (2011); ill-starred (2009); Lawn of the Limp(2008); Avian Fable (2007); and Marionette (2004). Suniti received her BFA in dance from UWM in 2003, where she had the opportunity to work with many talented choreographers including Zvi Gotheiner, Janet Lily, Heidi Latsky, Simone Ferro and Long Zhao. While in the Midwest, she was a company member of both Foothold Dance Performance and Wild Space Dance Company. She has performed with Oslund+Co, Fever Theater and Teeth. She has been presented by PICA’s TBA festival, Conduit Dance, Reed College Arts Week, Danceworks, Velocity Dance Center, Northwest New Works at On the Boards, Danspace, Ten Tiny Dances’ South Waterfront Project, Foothold Dance Performance, Starling Gallery, the University of Wisconsin Milwaukee and Danspace in NYC representing UWM and she has received two residencies at Caldera Arts. Suniti received a grant from the Regional Arts and Culture Council in 2009, 2011, 2012 and 2015 as well as the Dance New Work Award from UWM in 2009. Suniti teaches weekly yoga classes and retreats through The People’s Yoga in NE Portland. 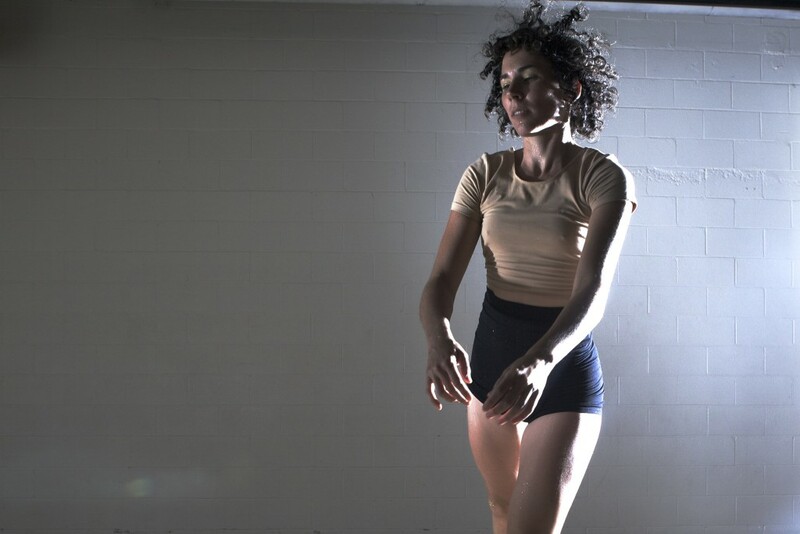 In her latest work, Portland-based dance maker Suniti Dernovsek stages a hypnotic performance that marries intricate choreographic detail with an original sound score performed live by Holland Andrews. Initially inspired by the tragic life of the Italian-Egyptian singer Dalida, Leading Light offers a haunting meditation on the troubled boundary between public expectations and private vulnerabilities. Powerhouse performances by Allie Hankins and Dernovsek evoke the precariousness of the feminine ideal, at once dynamic and posturing, yet casting an ever-present shadow of fragility. Iolanda Cristina Gigliotti (17 January 1933 – 3 May 1987), best known as Dalida, was an Italian Egyptian singer and actress who performed and recorded in more than 10 languages, including Arabic, Italian, Greek, German, French, English, Japanese, Hebrew, Dutch and Spanish. In 1961 she acquired French citizenship upon marriage, while maintaining her original Italian one. Dalida ranks among the six most popular singers in the world. Her sales figures today would amount to more than 170 million albums worldwide. Twice honored with “The World Oscar of success of the disc”, she is the only European singer to have won this Oscar at least once. Her 30-year career commenced in 1956 and ended with her last album in 1986, a few months before her death. She received 70 gold records and was the first singer to receive a diamond disc. Despite enormous career success, Dalida’s private life was marred by a series of failed relationships and personal problems. Her death led to an iconic image as a tragic diva and renowned singer and she has since become a cult figure to a new generation of fans.